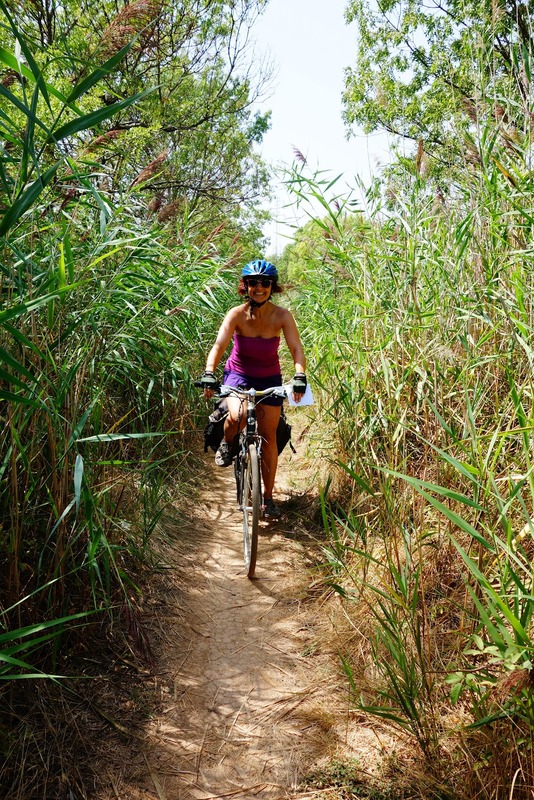 The Canal du Midi trail is the perfect bike trip for casual cyclists. The trail is nominally 240km and passes through the Languedoc region, from Toulouse to the Mediterranean in Sète. We chose a six-day package planned by Cyclomundo and La Rébenne, which included bike rentals, accommodations along the route, and transfer of our luggage each day. The trip is self-guided and we proceeded on our own accumulating a total of about 280km. The accommodations arranged for our trip were varied and outstanding. In Toulouse our room looked out on the Garonne river, in Carcassone we sat on the hotel’s terrace bar a few meters from the medieval city walls, in Béziers we slept in the elegant and charming Château Raissac. We added an extra night in Carcassone – partly to see the pseudo medieval village created by Viollet-le-Duc and partly to visit Limoux, the birthplace of sparking wine. A lockmaster’s collection of recycled art including this guitarist. We started in Toulouse and biked 40 to 60 km per day. With stops to take photos, watch the action at locks and bio-breaks, (and excluding lunch stops) we averaged about 12 km per hour. The trail is flat, nearly all off-road, mostly shaded and passes through an idyllic French countryside that feels like a scene from a storybook. The canal seems not to have changed since Pierre Paul Riquet engineered it in the late 17th century. It’s no longer used for commercial traffic, but there are plenty of leisure craft cruising along. We encountered people on horseback and people walking their dogs, but the only wildlife we saw were ducks and swans. There are a few spillways to cross, the only challenges on an otherwise perfect path. The trail surface and condition varies, but with the exception of two sections where it’s necessary to walk carefully across a spillway, it presents no serious challenges. The trail is mostly packed gravel, with a few paved sections leaving Toulouse and Beziers. Tree roots make some sections bumpier than others. For our trip in August, the weather was warm (usually over 30 degrees Celsius) and dry and so was the trail, but it was clear that there would be some muddy sections in wet weather. The tunnel at Malpas and the gates at Libron are a little narrow for bikes with panniers, but we managed. Navigation is simple – follow the trail until it’s time to find your hotel for the night, then follow the directions provided by the tour. I brought my iPad (and purchased a microSim for data from Orange for 20 euros) to assist with maps and locations as well as to track our ride, but it’s certainly not a necessity. The lock at Peyruque, where a charming lockmaster served us a delicious café crème. Along the way there are a selection of cafés and restaurants to let you rest and refuel. Enjoying a perfect café crème at the lockmaster’s café at the Peyruque lock was one of the highlights of the trip. The barge Salambbo, hosting a small tea room under a canopy. A charcuterie plate in Trèbes – served on tables right at the canal’s edge. and enjoying a charcuterie plate at Les Vignes de Bacchus with a refreshing glass of blanquette (the local sparkling wine) in Trèbes. On the last day, between Agde and Sète, we stopped at a beach pavilion and restaurant on the Mediterranean and enjoyed a swim. The last section of the trail before the Mediterranean is sandy. For the budget conscious, there are many small towns on and close to the trail to stock up on picnic provisions. As you travel along, you make informal acquaintance with fellow travellers headed the same direction. Some were biking for the day, others were tenting their way along the route. The photos were taken using a Sony RX100, loaned to me by Sony Canada. Small, easy-to-use, great in the dark, with a large sensor that provides very high quality images. I love this camera.